We present an unexampled reset integrator control design based on the Clegg integrator system. Using an appropriate mathematical model of our Clegg integrator controller, stability proof of the closed-loop system applied to the vibration control problem of a second-order system is shown without invoking hybrid system theory. Furthermore, we illustrate the pplicability of our controller, from the numerical experiment point of view, to the suspension vibration control of vehicles. 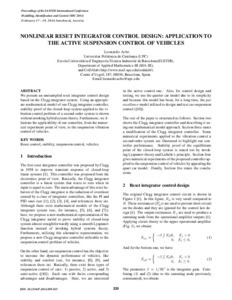 Acho, L. Nonlinear reset integrator control design: Application to the active suspension control of vehicles. A: IASTED-International Conference Modelling, Identification and Control. "Proceedings of the IASTED International Conference Modelling, Identification and Control (MIC 2014)". Innsbruck: ACTA Press, 2014, p. 226-228.